In most DUI arrests, officers administer the field sobriety tests immediately after they develop reasonable suspicion of intoxication. Reasonable suspicion is basically a hunch based on the officer’s observations. These observations include things like bloodshot eyes and an odor of alcohol. The FSTs establish probable cause for the arrest. There is no precise definition of probable cause, but generally, the phrase means an evidence-based hunch, as opposed to an observation-based hunch. Radar gun-issued speeding tickets are a good example. If an officer clocks a driver at 51mph in a 50mph zone, that evidence will probably not hold up in court. One mile per hour is usually within a radar gun’s margin of error. However, 51 in a 50 is sufficient for probable cause to issue a ticket, because it is a much lower standard than beyond a reasonable doubt (the evidentiary standard which applies in criminal trials). Similarly, when a DUI defendant “fails” the FSTs, it’s like being clocked at 51 in a 50. The Field Sobriety Test result is sufficient to arrest the defendant, but it’s not sufficient to convict the defendant in court. To see how this approach works, it’s necessary to look at the five most common FSTs. The FNT has several different variations. Generally, test subjects must tilt their heads back, keep their hands at their sides, and touch their nose with their fingertips. Usually, the officer has the defendant count or recite part of the alphabet while touching finger to nose. This test is an example of a divided attention test. Many scientists believe that intoxicated individuals have no visuospatial capability. They cannot think and move at the same time, because, according to this theory, alcohol disables that part of the brain. It all sounds good, and the theory may be sound in other contexts. But there is no scientific evidence underpinning the FNT. For this reason, the National Highway Traffic Safety Administration says that FNT results are not scientifically valid. So, arguably, the results have no legal validity either. If the test is invalid, why do officers administer it? Generally, officers try to fatigue defendants physically and mentally so they do not do as well on the tests that really count. To incorporate the aforementioned visuospatial aspect into the Romberg test, officers often instruct test subjects to silently count forty-five seconds and then open their eyes. If they can’t count accurately, they have no visuospatial capacity. The Romberg test has the opposite flaw from the FNT. The Romberg test is over-scientific. Chances are, the officer cannot explain any of these scientific aspects. 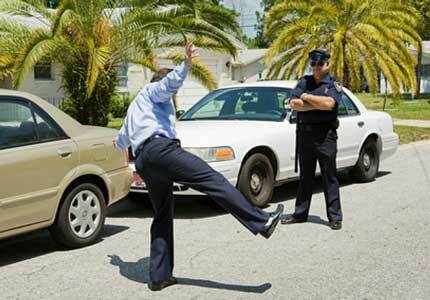 Instead, the officer just knows s/he is supposed to look for clues, like swaying or losing balance. This disconnect makes the officer appear incompetent and unqualified to make scientific conclusions based on certain observations. Generally, the HGN is the first test in the NHTSA-approved three test battery. Unlike the other field sobriety tests, the HGN is not a divided attention visuospatial test. Instead, it’s a purely scientific test designed to measure natural body reactions. Most people have probably taken a nystagmus test before. Test subjects must use only their eyes to track a fixed point, such as the tip of a finger, a low-intensity flashlight beam, or part of an ink pen. If the pupil moves involuntarily at certain angles, the subject probably has nystagmus. In the DUI environment, there are two problems with this test. First, like other scientific tests, the HGN test is only accurate under controlled conditions. Roadside HGN tests are definitely not controlled environments. The sky is usually dark, cars may be whizzing by at high speeds, the test subject is nervous, and high-intensity flashing lights are probably rotating in the background. Second, alcohol is not the only cause of nystagmus. In fact, intoxication is not even the leading cause of nystagmus, which is also known as lazy eye. Many people develop this condition after a childhood head injury. For others, nystagmus is a genetic condition. Other causes include certain types of medication, epilepsy, and cigarette smoke. This test is also known as the walking-a-straight-line test or the heel-to-to-walk test. Subjects must walk a certain number of steps heel to toe in a straight line, then turn around and walk back the same way. In theory, the WAT is one of the most reliable field sobriety tests. Subjects must focus on the number of steps and also maintain balance when walking heel to toe. That’s not easy for sober people to do, and it’s almost impossible for intoxicated individuals to do. But many times, the deck is stacked against the test subject. Sometimes, officers ask subjects to walk imaginary lines as opposed to actual lines. It’s very hard to stay straight on an imaginary line, especially if the surface is at all uneven and it’s dark. Furthermore, anyone with any mobility impairment has almost no chance to successfully complete this test. Officers sometimes ask about pre-existing conditions, but most people will say they do not have any such problem. The final FST in the three-test battery is the OLS. It’s also a divided attention test. Subjects must elevate one leg at a certain angle for a certain number of seconds. If they cannot maintain balance or lose count of the seconds, they are probably intoxicated, at least in theory. When grading this test, officers often focus on technicalities, such as dropping the leg a half-second too early or a very slight sway. Based on these technicalities, the officer testifies that the defendant “failed” the test. But most Cobb County jurors do not see these tests as pass-fail. Instead, they view them like school grades (A, B, C, D, and F). So, a little wobble here and there might merit a B or even a C, but not an F. And, if the prosecutor is using these tests to establish guilt beyond a reasonable doubt, only an F will do. Fortunately, the jury’s assessment is the only one that counts. The Field Sobriety Tests often do fine for probable cause assessments, but fall short of evidence beyond a reasonable doubt. For a free consultation with an experienced criminal defense attorney in Marietta, contact The Phillips Law Firm, LLC. We routinely handle matters in Cobb County and nearby jurisdictions.